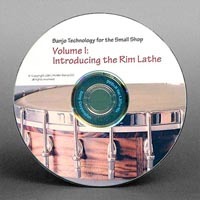 NOTE: The rim making DVD is still available, but I am making the contents public via YouTube videos. The DVD is higher resolution, but the content is the same as the YouTube Videos. You can access the YouTube videos here. The simplest way: go directly to PayPal. Send $39.95 plus $5 shipping via PayPal. My PayPal ID hicklerbanjo@gmail.com. Send a money order for $44.95 to the address listed on the Contact/About tab. You can order and pay via the Shopping Cart on this website. In the View Cart screen enter "DVD" in the box marked "If applicable, enter a Promotional Code". Update the Cart. The updated price will be $7 lower. When you get to the shipping screen, choose Flat Rate Domestic Shipping $12. The result is you end up paying the the same total as $39.95 plus $5 for shipping. If you are ordering multiple items, just choose the cheapest option or the option that suits you best. "Several years ago, Mark Hickler, author of this video set out to solve the fundamental problems of banjo making for the small-shop environment. Normal wood lathes do not have the means to guide cutting tools with the accuracy necessary to fit tone rings or other banjo hardware. Metal lathes have this capability, but to turn an 11” diameter requires a metal lathe that is too massive and expensive for the small shop. The lathe Mark has designed occupies a mere 4.3 square feet of shop space!" This video is an introduction to this amazing lathe created with off-the-shelf parts that can turn banjo rims to tolerances of a few thousandths of an inch. • Making and using "false jaws"
Click here for a customer review.